TreeKeepers is a non-profit partnership between Tree City and the Environmental Youth Alliance to grow the urban forest. Please note: we will not be holding a Holiday Tree sales campaign this season. Sorry. Every TreeKeepers tree you plant becomes part of the urban forest which provides ecological, economic and cultural benefits. Do your part to help create the world's Greenest City by planting a TreeKeepers tree today! Tree love is shared by everyone but tree knowledge tends to be low. We train Citizen Foresters to help neighbours plant and tend trees while students in the Youth Branch are inspired to become urban forest stewards of the future. The best thing you can do to green your city is to plant a tree. The second best thing is to help others plant more trees. Volunteers are welcome for tasks from spreading the good news to helping at our public events. Every tree planted helps make Vancouver a greener city. Each tree you plant helps make Vancouver a greener, cleaner and healthier city. Order yours online now for pick up later at one of eight distribution sites citywide. Deadline for orders is 5pm two days before the pickup date for each site. Supplies are limited and every year some species sell out early, so order early to prevent regret. Are you entering the TreeKeepers School of the Year Contest? Write the school name in your tree order form in the space labeled "School or Organization." The school mentioned most often wins a year worth of bragging rights, a cool trophy to grace your entrance showcase and $500. Flavourful dessert apple good for eating fresh off the tree or to store for up to 10 weeks. 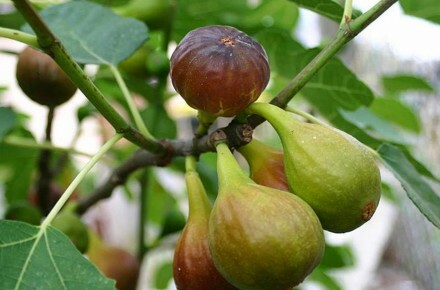 The medium-sized, bright red fruit which ripens around late September is sweet and aromatic. Developed at the Illinois Agricultural Experiment Station in 1965 from heritage Jonathan and other apples. 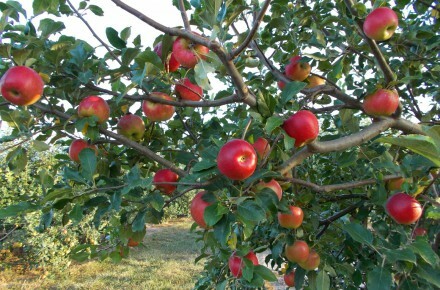 Has some resistance to some diseases rife in our moist and mild climate, including apple scab. Grafted onto M26 semi-dwarfing rootstock. 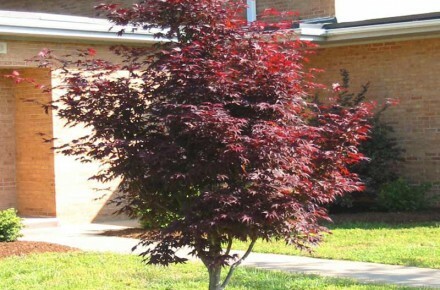 One of the most popular of the many Japanese Maples for its ongoing colour show. Deep purple leaves turn dark red in autumn. Also produces small purple flowers in spring followed by red samaras which ripen in autumn. 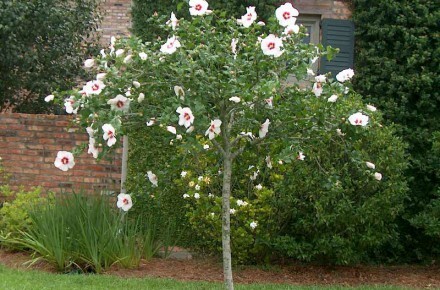 A small, rounded tree often with a multi-stemmed trunk which looks attractive even in winter. Spot lighting from beneath can add to its architectural interest, making this tree a prime feature of your yard or patio. The exuberant hollyhock-like blooms from June to October look like some exotic that belongs in the tropics, but this cultivar is known to be hardy and easy to grow. 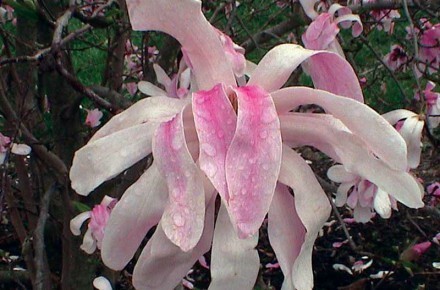 Can be trained as a standard tree with a single stem or left to grow as a multi-stemmed shrub. More compact than other types of this species, it matures at a height of 2-3m. Plant it where the butterflies can find it — they’re drawn as much as we are by the gorgeous flowers. 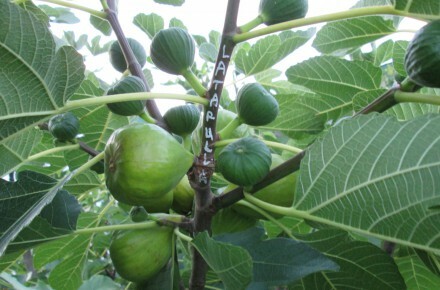 A classic variety producing large, tasty figs good for eating fresh, cooking, drying or freezing. Fruit has reddish-brown skin covering rose-coloured flesh. The Brown Turkey cultivar is believed to have originated not in Turkey but Provence, France. One of the most popular types grown by home orchardists around the world, Brown Turkey produce a large main crop (grown on this year’s new wood, unlike the earlier breba crop grown on last year’s overwintered wood), so it does best in a year with lingering summer warmth. No pollination required (the “fruit” is actually a shell containing tiny flowers). Suitable for a container on a sunny balcony. 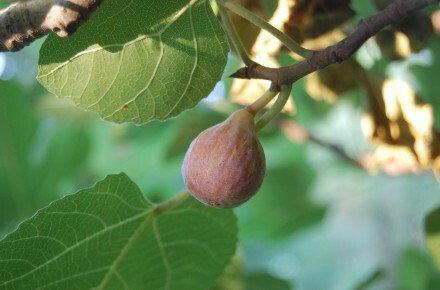 Also known as the Italian Honey Fig, undoubtedly as a testament to its flavour, the green skin offers an appealing counterbalance with a faint tartness that contrasts with the sweet, amber-coloured flesh. Produces medium-sized fruit. Lattarula are considered a good choice for cooler, shorter summer season areas such as ours. No pollination required (the “fruit” is actually a shell containing tiny flowers). Suitable for a container on a sunny balcony. A British Columbian gift to the world, Spartan was developed from 1926 at the Summerland Research Station and is now grown in Europe and elsewhere for its McIntosh-like flavour from crisp, juicy, white flesh. 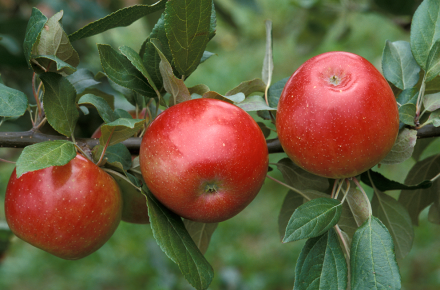 Medium-sized red apple over a yellow-green base that ripens around mid-October. There’s a good reason Spartan have been popular commercial apples for years, but of course store-bought produce can never match your own homegrown for freshness and flavour. Grafted onto M9 dwarf rootstock. Highly prized (and highly priced!) for its sweet, crunchy explosion of flavour when eaten fresh, Honeycrisp was developed in the 1960s at the Minnesota Agricultural Experiment Station. 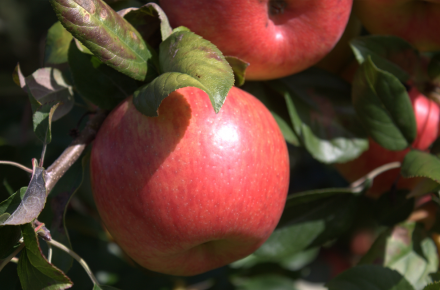 Medium-to-large apple with red-orange blush over a yellow-green background which ripens around early October. Because they have larger cells than most apples, Honeycrisp offer a juice-laden bite unlike any other apple. Grafted onto M9 dwarf rootstock. The Smiling Forest Lily Tree is as alluring as its name suggests. A rare (for us) broadleaf evergreen, it blooms with large, pure white, 9-petal flowers that emit an intense tropical fragrance. 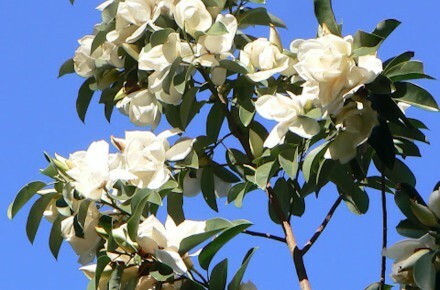 The silvery-green leaves are attractive on their own, similar to other evergreen magnolias while lighter in colour than, say, Magnolia grandiflora. Appealing year-round as a small to medium-sized tree, it is the spring bloom in March-April than can make anyone stop and smile. Hardiness rated for Zone 7, which means it should be fine in our colder Zone 8, but you may wish to protect it in a long cold spell. The flowers are used in traditional Chinese medicine. 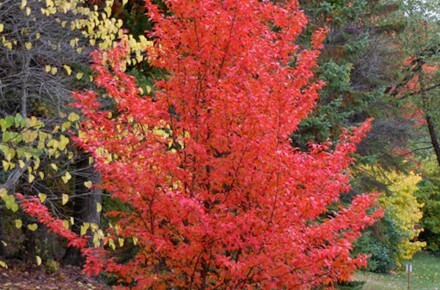 A broadleaf evergreen related to witch hazel, providing year-round greenery in an attractive package. 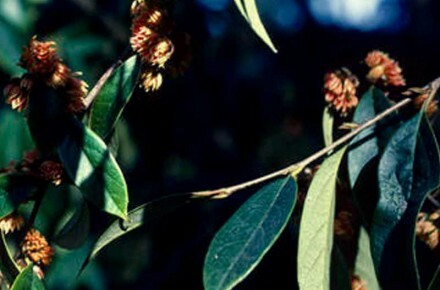 The leaves are narrow, pointed and densely arranged in a thick array of lustrous dark green. In February-March, the blooms emerge as small yellow puffs of flowers with long red anthers, offering a rare view of colour for the season. Native to central and western China. 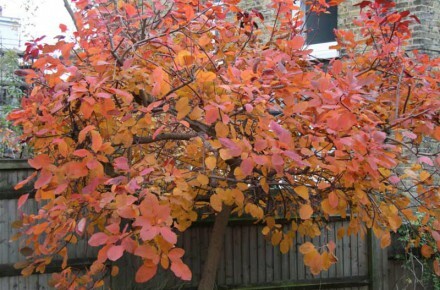 A great tree for a small space, Japanese Stewartia get better each year as they mature into a gracefully-shaped network of branches with exfoliating bark that shows colours of pink, red-grey and brown. The midsummer flowers are white and cup-shaped with yellow-orange centres. (The pseudocamellia species name tells you what flower they resemble.) Leaves are dark green during the growing season, turning in fall to oranges and reds. Grows slowly into a pyramidal shape. A favourite tree among real tree aficionados. An iconic tree of the Pacific Northwest, one that’s valuable enough to have its own ecosystem named after it. 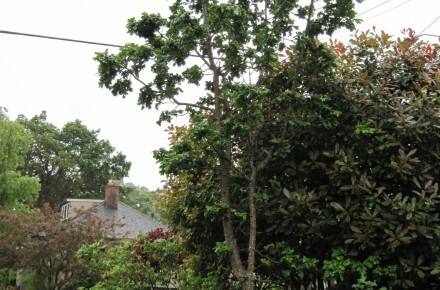 While not appropriate for some yards due to their mature size, which over time may reach 20m x 20m, those with space and the inclination to create their own sanctuary (Garry Oak ecosystems are threatened in the wild) could use this tree as an anchor for a native habit garden replacing the lawn. Since they prefer warm and dry conditions (think of the Gulf Islands) they may grow more slowly and to smaller sizes in our cooler and wetter conditions…unless climate change and longer drought periods leave them feeling right at home here. 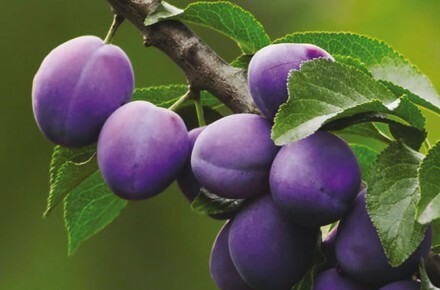 First bred in Hertforshire, England, in 1901, this tree produces plums that are large and oblong with deep blue-black skin and yellow flesh. The flavour has been described as sweet and rich. Late-season harvests (from mid to late September) are abundant once the tree gets established. President plums are good for eating fresh, stewing or drying. 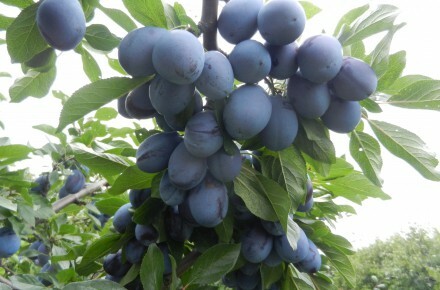 Requires pollination from another European plum (such as our other plum selection offered this year). Originating near Yakima, Washington, in 1935, this variety produces fruit that’s larger and sweeter than the standard Italian type. It also ripens earlier, in mid to late August. The large, oval, blue plums are good for canning, drying or eating fresh. Leave the fruit on the tree until it fully colours up to get the best flavour. Requires pollination from another European plum (such our other plum selection offered this year). Which Tree is Good for Me? Please accept our apologies for any missing links or mis-sized images or blocks of baffling Latin. We're in the final stages of a major redesign of our web presence, thanks to Lara Kroeker and her ace team at Randomlink Interactive. Metro Vancouver Close Up is a "showcase for municipalities taking the lead on sustainability." For this show they featured a Citizen Forester training session.